Code ASCII relates to a standard that is used by computers to translate human readable characters into something computers can understand. 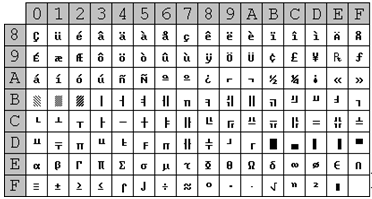 Code ASCII is usually provided in the form of an ASCII table. Even though the evolution of code ASCII is responsible for a number of extended versions, the original code ASCII is a table with 128 characters and their universally accepted translations into computer language. What is code ASCII? You probably know that computers speak in the language of 1s (ones) and 0s (zeros). You can create a sequence of 1s and 0s to express any numerical value as its binary translation. Just a note on the side, converting numbers into binary is a simple mathematical operation (take a look here decimal to binary converter). However, there is no such evident way to translate non-numeric characters (letters) into binary (into sequences of ones and zeros). Let's say you have the letter Z. How do you translate that into ones and zeros that the computer can understand? The answer is code ASCII. Code ASCII is a universal standard that sets in stone how letters should be translated into ones and zeros. The standard code ASCII table defines 128 character codes (from 0 to 127). The first 32 codes in the basic code ASCII table are called control codes. They are non-printable, and you most likely do not have the opportunity to encounter them in your daily life. These code ASCII characters such as start of heading, horizontal tab, backspace, shift out, and others were used to control printers back in the old days. The first character following the set of control characters - a space - is considered an invisible graphics. The remaining 94 code ASCII character codes are representable characters. The last character is a DELete control code. This code ASCII chart is organized in a way that row numbers represent the first digit and the column numbers represent the second digit in a hexadecimal notation. For example, the "B" character is located at the 4th row and the 2nd column. So, the letter B would be represented in hexadecimal as 0x42 (that is decimal 66). See our hex to decimal converter. Code ASCII and other characters? You might be asking now, how do computers understand other characters that are not included in the basic code ASCII table. For example, what about the letter which can be found in many German words? Most systems nowadays use 8bit bytes which can represent 256 different values. It means that in addition to the 128 standard ASCII codes there are other 128 codes which are known as extended code ASCII. Extended code ASCII is platform and locale dependent. There are a number of extended code ASCII sets, such as OEM extended code ASCII, ANSI extended code ASCII, code ASCII-1963, code ASCII-1967 (used on ZX Spectrum computer), ISO 8859-1 (also called ISO Latin-1), and many others. There is more than one extended code ASCII character set reflecting the needs of a particular language, platform, and localization. The table above shows the most used extended code ASCII character set which is known as the OEM extended code ASCII set. The OEM extended code ASCII set is used by the hardware of the most PC compatible machines. This OEM extended code ASCII table was also used by the DOS. As you can see, the OEM extended code ASCII set includes some foreign signs. To conclude, the concept of code ASCII is pretty self explanatory from the code ASCII acronym. ASCII stands for American Standard Code for Information Interchange. Code ASCII is a standard for information interchange. If you want to know more about code ASCII, see the following articles. In case you have any questions about code ASCII, visit our discussion forum.